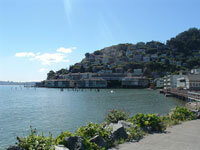 Located at the north end of the Golden Gate Bridge, Sausalito is a half hour ferry ride from Fisherman's Wharf. The panoramic view of San Francisco Bay is spectacular, and Sausalito's sunny, inviting outdoor cafés and small shops overlooking the city are simply charming. One of the chief attractions in Sausolito is the docks where wealthy San Francisco residents dock their yachts. Tourists can hire bikes from Pier 39, Fisherman's Wharf and ride to Sausalito across the Golden Gate Bridge, have lunch and return on the ferry.